The Moroccan trade union movement was active in liberating the country from colonialism: Formed in 1955, the Union Marocaine du Travail (Moroccan Labor Union, UMT) was the first national union for Moroccan workers. Trade unionism, although tolerated for French and European workers by the colonial administration, was banned for Moroccan nationals, and the UMT had to operate clandestinely until independence in 1956. 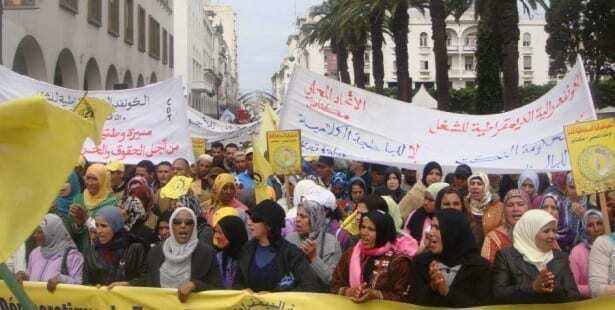 Successive splits occurred in the Moroccan trade union movement in the post-colonial era. In 1960, the pro-independence political party Istaqlal formed the Union Générale des Travailleurs du Maroc (General Union of Moroccan Workers, UGTM). In 1973, the Union Nationale du Travailleurs du Maroc (National Union of Moroccan Workers, UNTM) was created, with ties to the Party of Justice and Development, the Islamist political party currently in power. In 1978, political differences split the UMT and resulted in a new confederation, the Confédération Démocratique du Travail (Democratic Labor Confederation, CDT). In 2003, the CDT split with the formation of the Federation Démocratique du Maroc (Democratic Federation of Labor, FDT). Morocco has not ratified International Labor Organization Convention 87 on the Freedom of Association and Right to Collective Bargaining and the ITUC’s annual survey of trade union rights notes that Morocco heavily curtails worker freedoms. Union organizing is particularly challenging, with laws from Morocco’s colonial past effectively criminalizing collective bargaining. The Solidarity Center works closely with its partners, the CDT and the UMT, to improve the wages and working conditions for precarious workers in the country’s agriculture and services sectors. Together with our union and community allies, the Solidarity Center also holds popular education and awareness trainings to help empower working women. By building the capacity of workers and local unions through leadership development and advocacy for the rights of women and young workers in the workplace, these programs are successfully translating into real economic and social gains—as demonstrated by the September 2013 settlement of the first-ever collective agreement for farmworkers in the Meknes region.